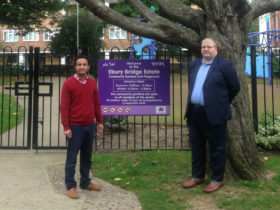 Labour Churchill Ward Councillors Shamim Talukder and Jason Williams met with the Ebury Bridge Estate Regeneration team to discuss the project and get feedback from residents. After the meeting, Cllr Jason Williams said: “We are keen to support residents setting up a Residents Association on the Estate and continued to ask officers to ensure they give residents trying to organise this their full support. “It is vital that any consultation on the future of the estate is transparent and represents the views of the majority of residents.